Description: Location! 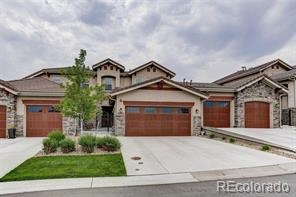 Fabulous luxury townhome backing to open space in coveted calmante with an open floor plan including finished walkout basement! Wonderful hardwood floors, granite countertops & stainless appliances. Spacious & light master suite w/ 5-piece bath and large walk-in closet. You'll love the large covered deck off of the great room/kitchen! Spacious lower level with family/rec room including a wet bar and refrigerator, bedroom, bath & covered patio. Close to trails, mountains, boulder and denver.